Each Lancaster had a Ground Crew. This was made up of skilled Craftsmen who Serviced & Repaired the Lancasters. Given the nature of the tasks the Lancaster’s were having to perform, this must have been an incredibly difficult job. Working around the clock at the lonely Dispersal Points, in all weathers, perched high above the ground toiling to get their Lancaster ready for the Night’s Operation and doing everything possible to ensure that no fault could occur which would endanger the safety of their Flight Crew. The hardest of all, how they must have felt after waiting for hours for “their” Lanc to return and then the sad realisation that it would not be coming back to the now more lonely Dispersal. Another 7 Men who would never be seen again but also never forgotten. Though FIIE(A) isn’t listed it may well be FIIE – Fitter (2 or II) Airframes. FAE is RAF abbreviation for Fitter Aero Engine, or basically very similar to the later Fitter IIE. Senior Fitters often retained their original Trade, one Flight Sergeant who was a Carpenter Fitter from the wooden Airframes. The changes in RAF Trades (and the terminology of Trades) over the years is fantastically complicated, but logical in its own way. Trades were totally tied to the demands of the emerging and sometimes retrospective Technology. Fitter I, who was qualified in both Aero Engines & Airframes. Fitter I was the highest Aircraft Technical Trade and such persons usually held the Rank of Warrant Officer. In the pre-War RAF a Fitter I Warrant Officer would have been the highest qualified Technical person on an RAF Station or Squadron. Particularly in Squadrons, there was no establishment for an Engineer Officer during this period, and the Warrant Officer was in charge of Engineering. The lower Trades of Fitter IIA & Fitter IIE comprised the next layer of knowledge and experience (or FAE and various of the other old-fashioned Trades) and the “basic” Trades were Flight Rigger (for Airframes) & Flight Mechanic (for Aero Engines). There were older, superseded Trades such as Rigger (Metal) which was introduced in the late 1920s when metal primary structures (usually steel, but some lighter metal structures also) became the feature in the newer Aircraft designs and Carpenter, for older wooden Aircraft. At the outbreak of WW2 the Fitter I was an endangered species, as their sort of experience could not be built up under emergency wartime conditions, and it became an obsolete Trade. Commissioned Engineer Officers were then introduced as the “Top Dog” at Squadron & Station level, and these men all came from the Ranks of experienced Fitter Personnel from the 2 Streams (Aero Engine or Airframe). As you may gather, the history of RAF Trades is a long and complicated story, and always in a state of flux. – from the Cockney pronunciation of Aircraftsman. The generic slang term for all non-commissioned Airmen below the Rank of Corporal was ‘Erks‘ – a term applied over many years before, during and after the War. This term was used with almost a degree of affection whereas the Official Term, ‘Other Ranks‘ was commonly resented. For the Ground Crews directly concerned with the Aircraft, however, they worked whenever work was necessary, even if this meant staying on the job until the task was completed, Day and/or Nnight. In support of the ‘spanner brigade‘ toiling out on the bleak Dispersal’s or in the draughty, unheated Hangars, each equally important in the overall ‘Teamwork‘. If the ‘vitality’ of certain apparently mundane Duties rather escaped those involved, without their backup the Organisation might have crumbled rapidly. When an Operation was ‘Scrubbed‘ the Crew would usually dash off to the Mess to celebrate being alive for another night. When Pilot Dave tried to ride his bike back to his Billett he kept falling Off and after a couple of attempts, he decided it was much safer to push it home. On the way, the Engineering Officer– Freddie Fawcett approached him and said ‘You look as though you have had a good celebration in the Mess!’. Dave replied ‘yes it was fun but a sore head in the morning isn’t much good‘. Freddie came down to more pressing business – We are having some trouble with R for Roger’s undercarriage how about Flight Testing her for us? ‘Dinna be daft‘ Dave said ‘I can’t even ride my bike‘ Freddie appealed – ‘You’ll be all right – if I can’t get it Air Tested the Mechanics will be up all night jacking up the Aircraft and pumping up the wheels‘ This reminded Dave of the many burnt hands of the Ground Crews he had observed and how they worked to keep his battered Aircraft serviceable. ‘OK, Then let’s walk down to the Airfield it might sober me up a wee bit’ When Dave arrived at R for Roger he walked around checking that all the Controls were free, he then removed the Pitot Cover from the Air-Speed measuring device. Freddie was his only Crew which was illegal already – he should have had his full Aircrew. Dave called the Control Tower for permission for an Air Test, and on receiving this the 4-Engines were started and carefully run up to check any drop in power. Dave taxied out to the Runway which had been lit for the Test as he swung onto the Tarmac, the throttles were opened, the Aircraft being without a Bomb Load was very light and took off effortlessly. Freddie held the throttles fully open till Dave took them over to reduce power. ‘All right let’s have a go at this undercarriage. Freddie selected the down lever, the Wheels swung down and there was a decided Clunk and the Green Light came on. He raised the Wheels and had a couple of more tries. ‘That’s fine Dave it seems perfect, Thanks a lot! We have only to get down now.’ Dave called the Control Tower for permission to Land, and on the downwind funnel, he asked Freddie for ‘30° of flap level please.‘ Easing her down to 500ft he asked ‘Full Flaps‘ Dave made one of his better Landings, no doubt he was concentrating hard on his illegal responsibility. At the dispersal area, Dave & Freddie closed down the Engines and locked the Controls. As Dave climbed through the Fuselage he was horrified to see about 20 Airmen in the main body of the Aircraft, – they were up for a joy ride and had obviously more faith in Dave’s ability to fly under the influence of drink than he had himself. No examination of Squadron Operations can be very complete without a look at the usually overlooked Ground Crew, or “Erks“. They were the key to the ability of the Squadron to conduct Operations. Not only did they do their work well, but they often did it under terrible conditions. Former Aircrew always have incredibly high praise for these men. Every Squadron had a very large Ground Staff to keep it running. The Chief Administrative Officer of the Squadron was the Adjutant, usually at least a Flying Officer or above in Rank. Often a Veteran of WWI or an Officer too old for Flying Duties (although Squadron records show that “the Adj” often got Air time just to “get some in“), the Adjutant answered directly to the Commanding Officer of the Squadron. Under the Adjutant’s Command were the Supplies Officer, Intelligence Officer, Catering Officer, Medical Officer, Signals Officer, Armaments Officer & Engineering Officer. Under each of these would be a complete Unit responsible for a specific facet of the Squadron’s life. The men in these Units would be NCO’s – Sergeants & Flight Sergeants – and “Rankers” – Corporals, Leading Aircraftsmen, and Aircraftsmen 1 & 2 (AC1 & AC2). The Catering Officer would have a number of Cooks under his Command, the Medical Officer would have Orderlies and other Assistants, and so on. In addition to these, each Squadron had, from its flying component, an Operational Leader in each of the Aircrew “Trades“, who held responsibilities in addition to regular Flying Duties. These positions were Gunnery Leader, Bombing Leader, Navigation Leader, & Signals Leader. The Team was vital to the success of every Mission by keeping the Squadron’s Aircraft fully Serviceable and they were ever mindful of the Crew’s personal risks. They only ‘loaned’ the Lancaster Aircraft to the Air Crew on the promise that they bring her back safe & sound and without any damage. The Engineering Officer was responsible for the Maintenance of all Aircraft and Aircraft Systems and it was his Duty to ensure these were always in a state of high readiness for Operations. On a mobile Squadron, related equipment such as starters, batteries, motor transport, gasoline tankers, bomb tractors, etc. all came under his Command as well. It was his responsibility to see that the maximum number of Aircraft from the Squadron were Serviceable and ready for Ops at any given time. Serviceability levels were a matter of pride to Engineering Officers as well as being of great importance to the effectiveness of the Squadron as an Offensive Force. This job was made even more difficult in a theatre of War where the supply lines ran all the way back to the UK where spares were scarce and working conditions terrible. In addition, unlike Aircrew, who passed through the Squadron after completing their Tour of Operations, Ground Crew stayed with the Squadron “at the King’s pleasure” – until posted to another Base or Duty. Their morale & pride in their work remained so high was a compliment to their training & character. The RAF prided itself on having the best-trained Ground Crews in the World. The “Halton Apprenticeship Programme” started by Air Vice Marshall “Boom” Trenchard, saw “boy Apprentices” enter the Program at age 15 and undergo a rigorous education of 3 years before starting their Service with the RAF at age 18. 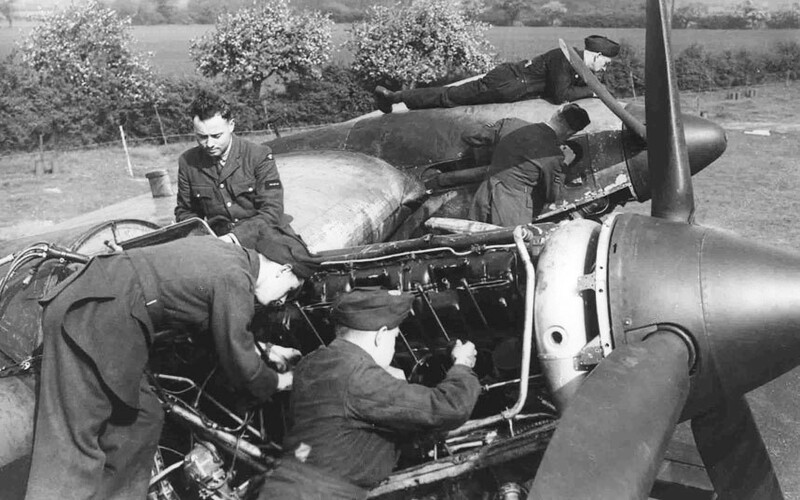 The demands of the War eased this standard somewhat and many Technical Trades from “Civvy Street” were trained by the Regular Force as Ground Crew in the RAFVR. The basis for a Ground Crew was the Flight. Within a Flight of Aircraft (which could range from 6-9 Aircraft), Ground Crew would be designated to service certain Aircraft. Ideally, one Aircrew would have one Aircraft, but often this was not possible and the Crews would have more than one Aircraft to look after. These men took great pride in their Aircraft. In fact, it was often felt, and very often said, that the Ground Crews “owned” the Aircraft and “lent” them to Aircrew provided that they bring them back in one piece. The unofficial motto of these Ground Crews was “Ubendum – Wemendum”. On a typical day when “Ops were on” for that night, the preparations would begin early in the morning with the Daily Inspection (DI). The Crew that had last flown the Aircraft on Ops would come “down the flights” to discuss any Equipment or Performance problems encountered on the Aircraft with the Ground Crew. These would be duly noted on the “snag sheet” (Form 700). As long as the Ground Crew had Form 700 the Aircraft belonged to them and was their responsibility. Only the Ground Crew could certify an Aircraft as Serviceable for Ops and no one of any Rank could order an Erk to sign off the Form 700. Only when all “snags” had been checked off and the Captain of the Aircraft had signed off the Form did the responsibility for the Aeroplane go to the Pilot. Daily Inspections included a check of all Engine Controls & Parts, all hydraulics & pneumatics, all electrical systems, radios, navigation aids, lights, brakes etc. It also included the repair of minor battle damage and attention to anything reported by the Aircrew on the “snag list”. Ground running of Engines to check for “mag drop“, fuel leaks, oil burning, sticking sleeve valves, etc. were also part of the Daily Inspection. In addition to the DI’s, the Engineering Officer had to schedule Aircraft for major inspections & overhauls in such a way as to have some Aircraft Serviceable at all times. Erks came in many forms. “Fitters” were generally responsible for the Engines and other mechanical parts of the Aircraft. “Riggers” were responsible for the Airframe and the related components including Fueling. The term Rigger came from the days of the old wire-braced Aircraft where there was literally Rigging in the form of wires & turnbuckles to be attended to. Preparations for Operations continued with the completion of an NFT or Night Flying Test by the Crew who were to fly the Aircraft on Ops that night. NFT’s were flown during the Day and usually lasted about 30 minutes, during which the Aircrew would check the Operation of all Systems and report any further snags or glitches. After the NFT, the Ground Crew would repair any new problems reported, then begin to prepare the Aircraft for that nights “Ops”. Operational Preparation consisted of filling the Aircraft tanks with sufficient 100 Octane Avgas for the distance to the Target. Preparing a Lancaster for an Operation was always a balancing act between fuel weight, bomb load weight and distance to Target. In other words, to Fly farther required more Fuel which represented more Weight, and since the total “all up” weight of the Aircraft could not be exceeded, that meant a smaller load of Bombs could be carried. The Fuel System and change over between all of these tanks were a confusing set of valves & taps. In addition, oil had to be added to the Engines. During Flight oil had to be pumped at regular intervals to the Engines using a manual “wobble pump“. Hydraulic fluid was also essential for the Operation of the Gun Turrets & Undercarriage as well as compressed air to run the Flaps and the Brakes. Oxygen Systems had to be checked and filled and Intercom Systems had to be fully functional. A duff Intercom was a reason to “Boomerang” a Sortie since the Crew had to be able to communicate with each other in order to function. The type of War load to be carried was specified in the Operational Orders that came down to the Squadron from Group HQ. 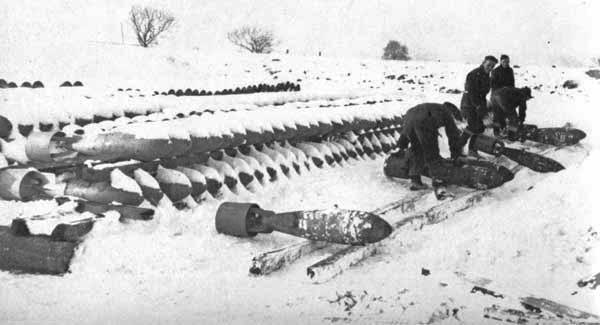 Bombs & Flares had to be transported to the Aircraft Pans from the Bomb Dump where they were stored. At the Dump Fuses & Detonators were installed and safety wires attached. The Bomb was fused by the rotation of a small propeller on the nose or tail which, when it was turned by the Air-stream after dropping, would twist a forked rod inside the Bomb and set the detonator to “active“. A time delay was built into high explosive Bombs ranging from a standard .025 secs (to give the Bomb a chance to penetrate a building before exploding) to several hours or days to cause disruptions on Airfield Targets. Bombs were winched into the Bomb Bay Cells on carriers using a winch system that was built into the Aircraft. A crank handle would be placed into holes corresponding to different locations in the Bomb Bay and the Bombs manually winched up. Balancing the different types of Bombs was essential for the Flying characteristics of the Aircraft. Each Aircraft on the Squadron might have a different Bomb Load for an Op. Illuminators would be loaded with 54 magnesium parachute flares in bundles of 3 on the 18 Bomb carrier stations. Other Aircraft would have a mix of high explosive Bombs (250 lb. GP, 500-lb MC, & 4000-lb. HC); some would have a load of SBC‘s full of 4-lb Incendiaries. Naval Mines required the assistance of Special Armourers from the Royal Navy. Each Bomb had to have its fuse set for the required timing, detonators inserted, the safety wire attached to the carrier, the tail fins installed and inspected for dents and the shackles on the carriers checked for a firm grip. The settings & placement of the Bomb Load would then have to be given to the Bomb Aimer of the Flight Crew so that he could set up his Bombing Panel. Often there were also ‘Nickels‘ to load onto the Aircraft – usually in the Fuselage where they would be manually tossed down the Flare Chute, but sometimes in the Bomb Bay where they would be dropped with the Bombs. There were also many small jobs done by the ground crew did which, while they seem unimportant, were critical. All perspex surfaces were polished carefully. A speck of dirt on a Turret could easily be mistaken for an attacking Night-Fighter. Anti-icing fluid for the Windshield was an absolute necessity and the fluid tank had to be topped off and the pump checked. All lights had to be checked for proper operation as well as checking the dinghy, flare pistol and other Emergency Equipment that could mean life or death for the Aircrew. Tyre wear was a constant problem on the rough Runways of Italy and Tyres had to be carefully inspected. A blown Tyre on takeoff with a Full Fuel & Bomb load was usually fatal. 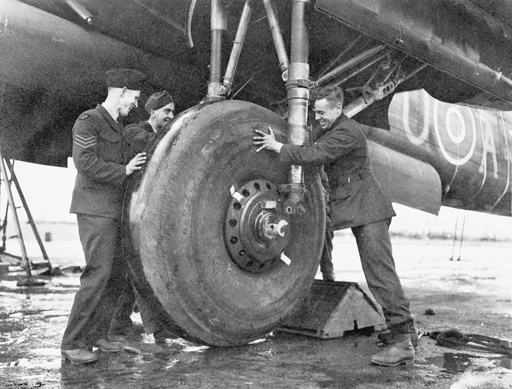 Wellington Tyres were in such short supply on 37 Squadron that ops were almost brought to a stop at one point in 1944. All of this work took place outside – there were no Hangars. In the blazing heat of the Desert, Riggers had to wear asbestos gloves to work on metal parts. In the cold rain & mud of an Italian Winter, Fitters had to take off their gloves to reach various components, often suffering Frostbite as a result. Armourers usually had to crouch in the mud & muck of the perimeter track to winch the Bomb Load aboard. It was also a race to get the Aircraft ready for take-off on time. Meals were often taken “on the hop” in order to ensure that Aircraft were ready. As the Aircrew took over the Aircraft there were often last minute problems to be overcome. Aircrew were given special instructions regarding the status of the Aircraft and wished “good luck”. Engine start was supervised by the Ground Crew Chief along with the Pilot. An Erk was required to operate a priming tap in the wheel well and to connect & disconnect a starting battery in order to start the Engines. The final Ground Crew job was to pull away the chocks from the Wheels so that the Aircraft could taxi away. At the end of this long day, tired Erks went for their meal of fried “bully beef” & tea, then retired to their shack-like Tents which were heated by the very Engine oil that they had drained from the Aircraft Engines. A few hours of sleep on a makeshift bed and the routine started all over again. The job was dirty, tiring, required great attention to detail and was extremely dangerous. Many Erks gave their lives so that the Squadron could continue to play an important role in winning the War. Armourers working with high explosives, tricky fuses, detonators, unexploded time-delay Bombs & Flares were all too often killed by their work. Fitters &d Riggers could be injured or killed by idling propellers or falls from wet & slippery Aircraft. In the Desert and early in the Italian Campaign there was always the threat of Enemy Attack on the Airfield. Constant movement caused many casualties. Crashes Flying between Airfields were all too common. Others were killed when Motor Transport slipped off roads in the icy Italian winter. All Trades were subject to malaria, dysentery and other diseases of the area and many died from their long exposure to this threat, weakened by substandard rations and poor housing. Many Crews recount the times when all other Aircraft had returned and were standing on their Pans, and there were 1 or 2 empty Hardstandings filled only by the erks, patiently waiting, and praying, that their aircraft would return home. with nothing but “props” on his sleeve. and just orders his own beer – and pays! and “Three Cheers for the man on the ground” ~ Flight Mechanic E Sykes (1942). Always putting their best work into the job at hand to do their part to bring the Crews home safely. The Ground Crew members were not exempt from the harms of War or accidents which killed & injured many in their number. Climbing up slippery wet or icy scaffolding, crawling across wings & fuselages under these same slippery conditions sometimes let to serious mishaps. Even in the best attempts to work safely, working with heavy items such as Engines, Wheels or being in the wrong place could bring about deadly consequences. The cold & wet would also take their toll on the health of the Tradesmen too devoted to the job not to continue when they should have been Hospitalised. For the most part, the Aircrews respected the work that the Crews put in to keep the Aircraft in top form. Sometimes it was a simple “well done” to the Sergeant in Charge from the Officer signing off on Form 700, the Official Form returning the Aircraft to the Aircrew for their journey into the Hell over of the Fortress Europe. Only as one ‘progressed‘ further back from Front-line Operations did the gap open up between the ‘leaders‘ and the ‘led‘, widening overly as that ‘Range‘ increased…… ‘Press on rewardless‘ might well have been sanctified as most Erks’ official motto…..!